December was certainly one of those months. I still kept busy, and income sources weren’t in short supply, but a startup I invested in officially failed. That stung more than I let on, and I’m still processing it. I was also starting to get very tired, and that’s when a few silly (but not critical) mistakes were made. I had several early (and long) shifts over at the university (doing theatre tech work) and my brain faculties were shot, so I ended up leaving one of the shifts earlier than I should have. I also spent more money than I even realized. There were a few offers I couldn’t refuse (aren’t there always? ), but I’m planning on dialing back a bit here in the New Year, and may not be running ad campaigns for a while. Fortunately, I still have good income prospects. But there were some definite upsides to December. I finished building my security bucket. What’s a security bucket? Well, Tony Robbins suggests having three different buckets for your personal finances – a security fund, a dream fund, and an aggressive growth fund. I was able to start 2016 with six month’s worth of expenses put away, which has meant that I’ve been able to start on those other buckets. I also got a decent amount of rest during the Holiday season. And though I wasn’t able to get away (from Calgary area) for a couple of days like I wanted to, I had a decent amount of time to reflect, the results of which I’ve already talked about. With physical copies of my book on the way, I’m excited for what’s next, and if I’m indeed able to complete my goals for 2016, I will be elated. I may not have been diversified in December (well, you’re only seeing my music related income sources here), but the focus appears to have paid off. My freelance blogging and music instruction efforts more than made up for whatever I may have been lacking in terms of product sales, gigging, sound engineering, and so on. This begs the question… is it better to be doing fewer things, or is it better to be diversified (this is the most music related income I’ve made in a single month since starting my income reports)? At this point, the results are inconclusive, but there could be something there. 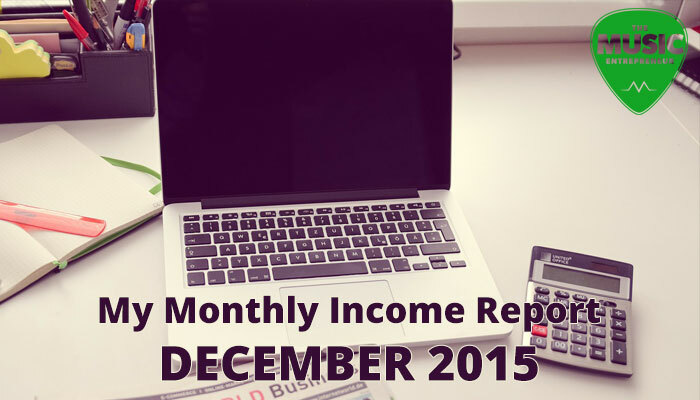 And just in case, I always advise readers to check out my first income report to really make sense of these numbers. There are a few caveats worth noting. Domain renewals. Subscription services. Advertising. Web hosing. I had a lot more expenses in December compared to preceding months (some of which you won’t see here as they are unrelated), partly because I had some promotions going on, partly because some of the other work I do necessitates it, and partly because I had some give in my budget. I also couldn’t pass up an opportunity to rejoin Fizzle at a heavily discounted rate. It is an incredible resource for online entrepreneurs, but if you can’t see yourself subscribing to a service like that, their podcast alone is absolutely worth listening to – funny, entertaining, and very informative. I still have financial stability in my life, but with debt freedom in sight, I am thinking about running a tighter ship in the next few months. It’s been fun investing in new gear and subscription services I’ve been meaning to take advantage of, but now’s not the time to veer off course. I’m going to get focused again! What excites me most is that I’m beginning to figure out my revenue streams for this business (The Music Entrepreneur). There’s a little mental tweak that has really made the difference for me. I used to think about what I need to do to get this business to the point where it can support me full time. Now I’m beginning to think about what I would have to do for this business to be supporting me full time. Like I said, it’s a subtle adjustment, but an important one. Advertising: I’ve had mixed feelings about serving ads on this site, though I have experimented with them the past (if you have any thoughts, feel free to contact me). Unfortunately, I don’t ever see it becoming a major source of income, primarily because of the growing popularity of ad blockers. But I’m publishing three posts per week right now, the site is growing fast, and every revenue source counts. Plus, advertising income is passive. Right now I just have one ad in the sidebar, and that’s all I ever intend to implement. Affiliate offers: I am already promoting a variety of different offers on this site, including books, hosting plans, WordPress themes, music related resources, and so on. When you purchase through the provided links, I earn a small commission at no added expense to you. And I’ll be perfectly honest – I haven’t made much money at all this way. But I know that this is all about building trust with you and giving you a better look into the products I’m promoting, so this is something I intend to do better and better as I continue to build the site. Consulting: for serious, ambitious artists with a budget. I haven’t been promoting the consulting (or shall we say personal coaching) side of things on the site much, but it is something I offer, and some of you have already reached out to me about it. There’s plenty of opportunity to scale up in this regard, so I need to get to work on a page promoting my service. Digital products: eBooks and audio courses – the kind you can find on the resources page. This has been a smaller source of income so far, though The New Music Industry eBook has been doing better than anything else I’ve ever produced. Clearly, this is one of those situations where I need to keep doing what’s working. Courses: I guess this would fall under “digital products”, but I will be taking a slightly different approach with these. I want to give away several free lessons before asking for any kind of financial commitment (and even if you never buy the full courses, you’ll still get those lessons for free). Physical products: everyone seems pretty fired up about physical copies of The New Music Industry, which will be forthcoming. I’ve recognized that these can be sold at any events I put on, and it might give me an excuse to organized more workshops and get-togethers. Events: like book signings, workshops, maybe even conventions on a smaller scale. I actually want to get your thoughts on this, and will be creating surveys in the future. You’ll have to let me know what kind of workshops you’d love to attend. You can go ahead and contact me if you already have some ideas. Sponsorships: I know, I know, the podcast is on hold right now. But that doesn’t mean I haven’t thought about monetizing it, and in fact, I have found one offer that I could start promoting right away. Before I do anything with that, however, I need the right people, strategies and resources in place. These are just some of the thoughts that have been running through my head, but ultimately, who knows? For now, I have my goals and projects picked out, so I’ve got to put my time and energy towards finishing those. By the way, if you enjoyed this, you can also check out last month’s income report.